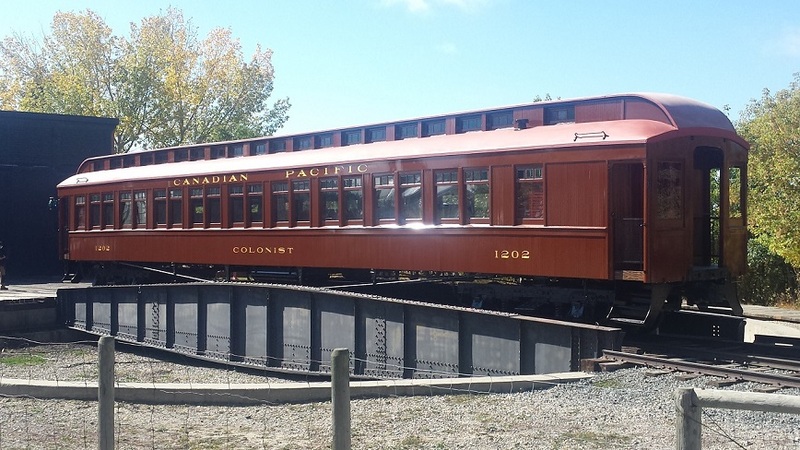 On September 20, 2018 Heritage Park in Calgary rolled out from its small roundhouse and shop the reconditioned Canadian Pacific Colonist Sleeping car No 1202. 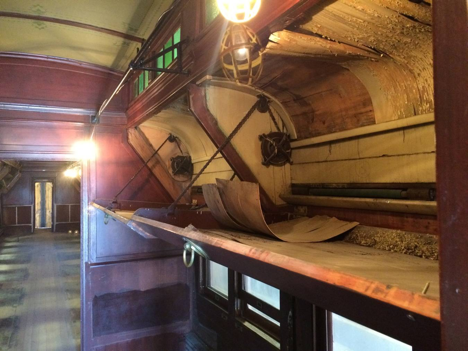 The major work took two years and eight months to complete with more than 14,000 man hours contributed to restoring the coach to almost new condition within a historical context. 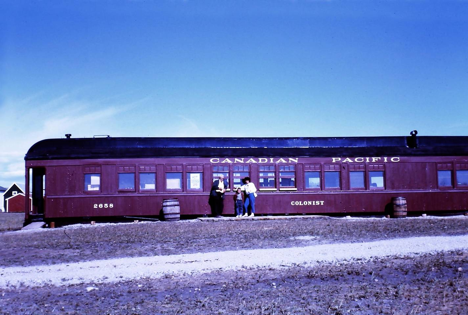 The story of Canadian Pacific Colonist sleeping car “1202” is one of deep interest in the history of Canada. It is a tale of a sleeping car that carried many of the early settlers and immigrants to various parts of the country and in particular the Canadian West. Those who came were the people who opened the West and built Canada. Their hard work, determination, optimism and sacrifice’s gave this country its identity. The foundation of Canadian culture, if it can be defined, is multiculturalism. Prior to 1940, all cultures in Canada shared one thing in common: their use of the transportation system that was then in place – the steamships lines on the seas and railways on the land. Today few tangible links remain of that network which brought thousands of new Canadians to new homes in a new nation. Hundreds of colonist cars were built in Canada and used by various railways during the railway passenger era that existed between the 1850’s and the 1970’s, for the specific purpose of transporting new Canadians to their destinations. The scale of this movement by rail was not matched by the railways of the United States nor elsewhere. It is a unique Canadian phenomenon. US immigration is often associated with the ‘wagon trains’ which travelled to the West, while in Canada it is the immigration train and colonist cars that are remembered. CPR 1202 was delivered on April 7, 1905 as an all wood 18 section colonist sleeping car, one of two ordered September 15, 1904. The cars were built by the carpenters and craftsmen at Canadian Pacific’s Angus Shops in Montreal, Que., some of whom themselves had immigrated to Canada. Two other cars ordered a year earlier as 14 section Tourist Sleeping cars were changed on September 21, 1904 part way through construction to colonist sleeping cars and numbered 1200 and 1203. These two cars would also be delivered complete in April 1905, making 1201 and 1202 the prototypes for this second generation of colonist sleeping car. The first generation of this type of sleeping car were built between 1884 and 1892. Shorter in length, they contained only 14 or 16 sections and open end platforms. On completion, CP 1202 was shipped immediately to Chicago to the Pullman Company where an order for 20 Colonist Sleeping cars, CP 1229 to 1248 were copied and built to Canadian Pacific design and specifications and completed at around the same time in 1905. CP 1202 is photographed at the Pullman Company in Chicago April 12, 1905. The specifications and drawings for this car would be used for a large order of similar cars built by the Pullman Company in Chicago in 1905. (Collection of the author). The exterior design and style for these cars was originally developed by William Apps, Master Car Builder for the CPR from December 1895 to July 1901. His cars were designed to match a standard architectural look distinctive to Canadian Pacific passenger car rolling stock constructed after 1897, and these colonist cars were then built under the direction of his successor William Fowler CPR Master Car Builder, from July 1901 to July 1909. The outstanding feature was the three piece beveled glass in the upper transoms in the widows. 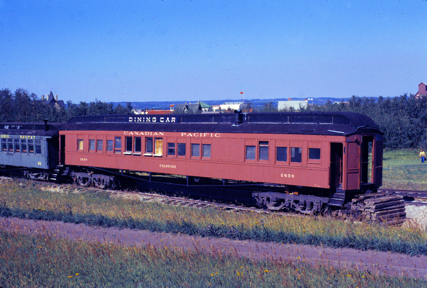 This class of wooden sleeping car marked the second of three generations of colonist sleeping cars unique to Canadian Pacific and built between 1905 and 1912. The interior design and layout of these cars would be developed by Fowler. The car bodies were 67 feet in length (end sill to end sill) and rode on two sets of four wheel trucks, known as composite trucks. 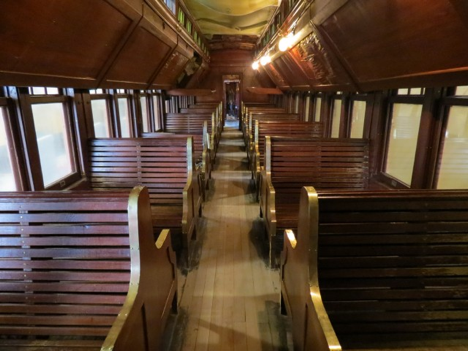 The cars were built with wide vestibules at each end, standard since 1897 and could seat a maximum of 56 persons in the main room and 16 in the smoking room, for a total capacity of 72 persons. 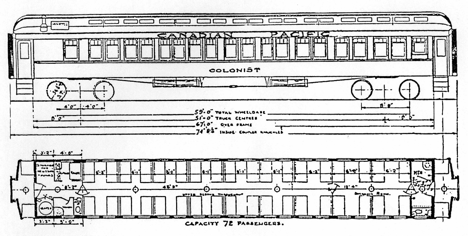 Floor plan and side elevation of colonist sleeping cars built between 1905 and 1912. Car length end sill to end sill was 67 feet, but over couplers more than 74 feet in length. The designation of “Colonist” on the outside of the cars was discontinued 1911-12. (Collection of the author). 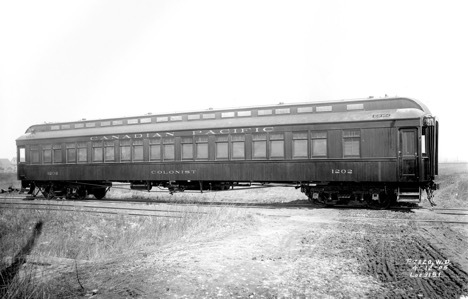 Between 1905 and 1912, a total of 135 colonist sleeping cars of this new design were constructed by both Canadian Pacific and the Pullman Company. 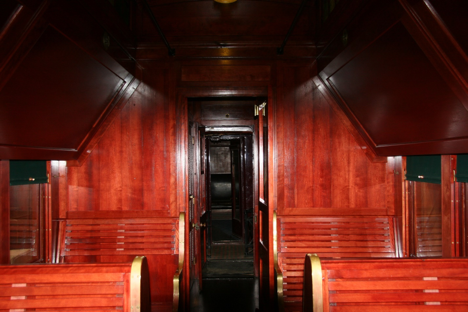 In the 1920’s around 200 wooden standard sleeping cars and dining cars were converted to Colonist sleepers of similar design. Adding to this number were a series of wooden Tourist sleeping cars also converted to colonist service. The next or third generation of colonist car would be of steel construction, built in two separate orders in 1914 and 1924. Canadian Pacific would build its last all-wooden passenger cars in December 1913. All later cars were then built of steel frame and body. Car 1202 was renumbered to 2502 in December 1910 and spent the first 26 years of life in revenue passenger service, operating between April 1905 and June 1931, when converted to boarding car service. In work or boarding car service it lasted until 1962 when stored at Ogden Shops awaiting disposition. In 1964 it was donated and transferred to the Park. In revenue service these cars carried new settlers from the eastern gateway ports of Quebec City, Quebec; Halifax, Nova Scotia; and West Saint John, New Brunswick. In each port the Canadian Government established immigration sheds as points of entry. Other gateways were located in Vancouver, and still later Montreal. Winnipeg had a large centre where immigrants would find temporary lodging having arrived from the east and/or the US while another immigration building was located in Calgary for those arriving from the Pacific North-West of the USA. Car 1202 was used for westward colonist trains departing from Quebec City in the summer months and from West Saint John in the winter months. During winter the St. Lawrence River was blocked with ice, closing both ports in Montreal and Quebec. Destination points for immigrants were settlements and homesteads in Manitoba, in the North West Territories, which on September 1, 1905 became the provinces of Saskatchewan and Alberta, and in British Columbia. One such destination in Alberta was the colony at Nightingale, a location of one of the CPR’s several ‘Ready Made Farms’ established just east of Calgary. The special CPR colonist or immigration trains met the new Canadians from Europe at dock side at Quebec, (Louise Basin) 1884-1930, then Wolf’s Cove 1930-1966; at Halifax Pier 2 1890-1917 and at West Saint John, NB 1890-1966. Colonist cars of the Intercolonial Railway met the new comers at Halifax and Grand Trunk trains at Levis across from Quebec. Later these two railways, along with the Canadian Northern and Grand Trunk Pacific Railways, also colonist car owners, would all become government Canadian National Railways. During the early 1930’s CP ships would use Halifax Pier 21 for a few years after a great fire on June 22, 1931 destroyed the sheds, docks and several colonist sleeping cars in West Saint John. During the era 1886 to 1941 the cars met others arriving from Asian countries at Vancouver, BC for those migrating eastward to Toronto and other Canadian centres and in many cases US destinations. 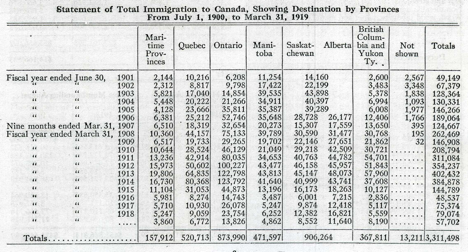 However, many of these immigrants were levied a head tax by the Canadian government until 1923. Of the several immigration sheds which served as gateways to this country, only the disembarkation shed at Halifax, the famous Pier 21, constructed in 1928, remains today. It is preserved as a National Historic site in tribute to all those who came to Canada. Colonist sleeping car 1202 remains one of only two wooden colonist cars which served as a link between such gateways and the destinations of the new Canadians, from the 1850’s until the end of the steamship and rail immigration period around 1971. Both cars are basically intact. The second is sister car CPR “2514” originally CP 1214 which resides at Squamish, BC, but is missing some of its interior and waiting funding to complete its full restoration. From the time of the first through passenger train to and from the West coast in 1886, at least one daily trans-continental passenger train and a number of other inter-city trains out of Montreal had a colonist sleeping car in its make-up until discontinued in 1957. The Colonist car at the Park in 1965 with the number 2658 as delivered from CPR’s Ogden shops. The car had arrived painted in CPR standard Tuscan red. (Collection of the author). Arriving at the Park in the summer of 1964, the car had been painted in CPR standard Tuscan red and numbered CP 2658. However there were no seats or lower berths, only the upper berths were somewhat intact. Little work had been done to weather proof or fully repair the retired 59 year old car and it would remain outside in the elements for another 28 years until 1993. A small number of similar cars had been reviewed at Ogden the year previous to 1964 and the best of the cars was selected; that car was CP 2658 built in 1912. But the car at the time was unmarked with its number painted over in a coat of paint, standard practice on cars retired in those days. It’s probable during the switching move another car had been pulled from the line before repainting Tuscan, and for some 51 years it was always thought to be CP 2658, until work began in March 2016. While outside, the car was used until 1971 as a concession stand selling hot dogs and ice cream through its windows. That year its four wheel trucks were exchanged with another car at the park for a short time for what purpose it was not recorded. Car 2658 for a time used as a concession stand is seen sitting on temporary six wheel trucks from the former Morrissey, Fernie & Michel Railway day coach No 60 which had been retired and scrapped in 1971 due to a major incident. (Collection of the author). In 1973 the car was given a quick refit and used in the filming of the CBC television production the “National Dream”. The interior was hastily restored to look like a colonist car and a number of short cuts were used. Make-shift seats were installed, plywood walls extended and a plastic material used to replace missing glass in some of the windows. Some of the structural wood was removed which later affected the strength of the car. The exterior wood on the car was sand blasted, also having a negative effect on the sides even though it had again been repainted a mineral brown colour. Interior of the car fitted up and featured in sequences of the CBC television documentary series the “National Dream” in 1973. Water damage to the interior roof and upper berths which occurred between 1965 and 1973 can be seen in this photo. A few of the windows in the upper deck sash of the clerestory were replaced with a coloured plastic. (Collection of the author). 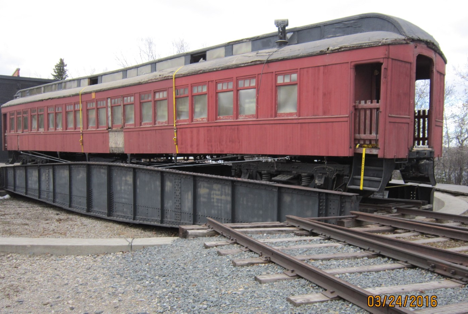 The car was relocated from the car shop where it had been since 1993 to the roundhouse where restoration work began. The car was so unstable strapping had to be used to keep the car together during the short move. While in the car shop a 2×10 had been placed at the letter board and supported to the wall of the shop to stop the car from leaning too far to one side. (Collection of the author). Early in the restoration as the leather seats in the smoking area were removed none of the car numbers found marked on the underside matched with 2658. 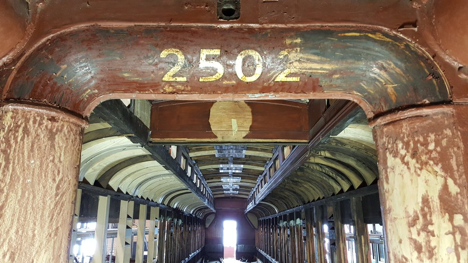 As the doors and windows were removed a review of the numbers stamped on the tops showed only the numbers 1202 and 2502, with no match to 2658. Once the end doors were removed it was suggested the paint be removed chemically, and found under the layers of paint and in gold leaf was the number 2502. Later a small metal plate was found on the car with the car numbers and dates of shopping confirming beyond any doubt the car was 2502, originally 1202. With the clean up the cars trucks, the work service number CP 407922 was found, again confirming the cars history. Gold leaf numbers with a thin black border outline was found above one of the end doors after several layers of paint had been carefully removed. At the opposite end the same number was found on the door itself. This view shows the large number of roof rafters that had to be replaced in kind. (Collection of the author). 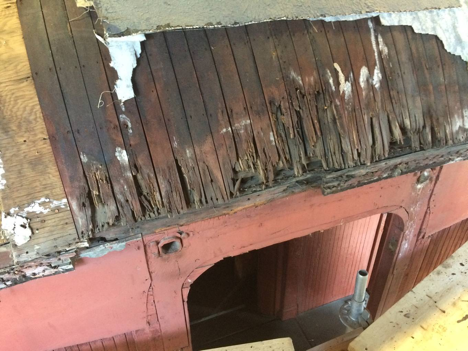 Rotten wood was found under the tattered canvas covering on the roof. Also found in the roof were a number of bird nests long vacated by the homesteaders. Dry rot was found throughout the entire roof and car body structure. (Collection of the author). With the canvas and roof boards removed the damage from rot can be seen to the roof rafters. More than 50% required replacing. Assistance from drawings and sketches made by members of the West Coast Railway Museum on their car ‘2514’ greatly helped in restoring the roof structure of this car. (Collection of the author). 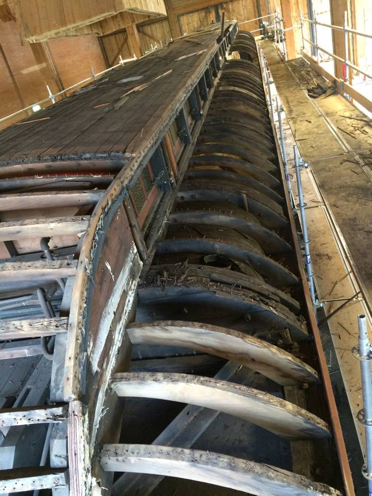 Heavy water damage was found throughout the interior and upper berth sections. Most of the missing brass fittings were duplicated by Adlake, a company famous for making parts for private railcars in the United States. (Collection of the author). 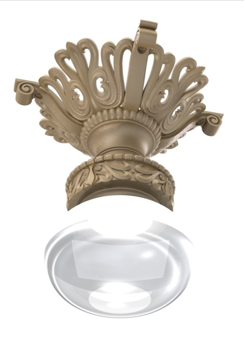 The interior gas ceiling lamps were reproduced in kind through digital photography, 3D imaging and computer-aided design and manufacturing. The image was copied from a hi-resolution black and white photograph of the interior of one of the cars that had been photographed in 1905. (Collection of the author). The finished interior shows the simple wood work within. 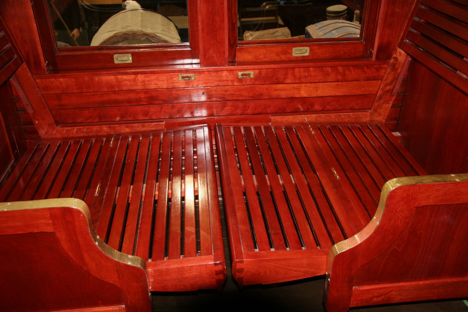 The bottom picture is of a lower berth formed from folding down the wooden seats. Typical of Colonist cars no bedding was provided. It was up to the passenger to purchase a mattress, bed cloths and berth curtains all sold by the railway at points of origin and places such as North Bay, Fort William and Winnipeg. Unlike tourist and standard sleeping cars, no porter was provided, allowing the passenger a much lower cost in transportation. A small kitchen with stove and oven is located at one end of the car. (Collection of the author). Work will continue over the winter months (2018-2019) completing small details not done in order to meet the deadline of the Railway Days events on the weekend of September 22-23, 2018. Small black pin striping will be added under the belt rail and around window frames as specified and the correct stencilling to the exterior will be completed. The mahogany doors etc. in the vestibules will also be installed. In all a restoration well done and as authentic as possible keeping the historical content as close to original as could be managed with today’s materials, with all work being documented.